Even in as bloody and bluntly violent a war as Americans encountered in the Pacific, Iwo Jima, the ultimate expression of death and mayhem, stands out. It was in a class by itself, a meatgrinder smashed by a blunt instrument at exceedingly high cost. Relying upon a purely attritional strategy of “defend and die,” Iwo's Japanese commander oversaw the construction of thousands of concrete bunkers, pillboxes, blockhouses, and other fighting positions as well as multistory underground command centers and barracks, some as deep as seventy-five feet. By D-day, February 19, 1945, most of these formidable defenses had been interconnected by eleven miles of underground passageways. Manning these positions were twenty-three thousand Japanese army and navy troops, many of them elite veterans of combat in the Pacific and China. Hundreds of mortars, artillery pieces, and rocket tubes had been painstakingly preregistered, allowing them to hit virtually any spot on the island with their first shot. The defenders had bonded into a brotherhood born of the hardship they endured building bunkers and underground passageways in the extreme heat laced with sulfurous fumes of the volcanic island. In the words of one Japanese soldier, Iwo “was an island of sulfur, no water, no sparrow, no swallow.” Beyond that, each defender took an oath to fight to the death, to give no ground for any reason. Following a seventy-four-day air and naval bombardment that the American high command believed had put the bulk of the Japanese defenders at least temporarily out of action, two veteran regiments of the 4th Marine Division alongside two regiments of the newly formed 5th Marine Division—eight battalion landing teams in all—led the way toward the island. Aircraft, battleships, cruisers, and destroyers pummeled ground targets near and far from the landing beaches. As the first wave of Marine-laden amphibian tractors climbed ashore, nearby gunboats fired hundreds of rockets to suppress enemy fire. Nothing happened. There was no return fire. No Japanese fired at the ships offshore, nor at the oncoming waves of amphibian tractors, nor at the Marines, who were surprised to learn as their feet touched down that all of southern Iwo Jima was covered in a thick mantle of black volcanic ash that offered no purchase for their feet or their shovels. Shortly, when the nearly eight thousand newly landed Marines had stopped along the shoreline to regroup, every Japanese gun and mortar within range opened fire on the exposed invaders. The gunfire did not die for thirty-four of the bloodiest days of the Pacific War. 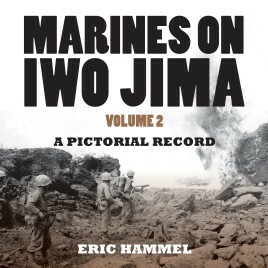 Marines On Iwo Jima: A Photographic Record is an enhanced and expanded ebook edition of the hardcover and trade paperback book entitled Iwo Jima: Portrait of a Battle. The much larger book requires that it be presented in two volumes, each with more than three hundred photos.